Your body is a dynamic environment of interrelating and interconnecting networks. Some of these networks are obvious and others are more subtle. Western science has focused it’s attention on the obvious networks such as the nervous, circulatory, and endocrine and lymphatic systems. In contrast, Oriental medicine has over the centuries, mapped out the subtle networks and interrelationships that reveal our bodies to be dynamic cellular ecosystems. By using a systems approach to health care, early Oriental practitioners discovered acupuncture points. They found that upon stimulating these points a cascade of positive changes occur in the body. Computer imaging of the brain during an acupuncture treatment shows dynamic activity occurring in many regions and structures within the brain. This modern research has shown that stimulating an acupuncture point causes and increase in the production of endorphins and simultaneously activates the immune and endocrine system. Dr. Cline will choose the most effective treatment plan to help you obtain you desired health outcome. Acu-points will be chosen to relieve pain and stress and to increase vitality. Cline Chiropractic and Acupuncture uses fine high grade surgical steel needles to stimulate the acu-points on your body. These presterilized and disposable needles are used “once only”. 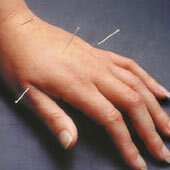 Acupuncture includes many modalities. Ask Dr. Cline about alternatives to needles. Millions of patients have enjoyed the benefits of acupuncture and Oriental Medicine. They reports the elimination or reduction of pain, and increase in function, and a greater sense of vitality and well-being. Contact Cline Chiropractic and Acupuncture to schedule an appointment with us and learn what acupuncture can do for you!